Finished uploading the match data for the rest of the periods. Visit the Statistics Portal to view the information. The match cards are now text tables instead of images, so you can highlight and copy whatever you like. Those who prefer images can still take a screencapture of the tables and achieve the same result. Match graphics for the Aquamarine Period are now available. Tab-delimited plaintext has also been made available for those wanting to do some data analysis. We will try to update these graphics and data after each match. Data for the remaining periods should be ready tomorrow. Our schedule drawing has finished. With every contestant now in her proper place, we can get to work on finalizing graphics and getting everything set and ready for the voting rounds. The contestants page has been updated to reflect the tiered arrangement of the contestants. The voting page now has the preview ballot for Aquamarine 1. More updates will occur throughout the week as more things can be set up. The schedule drawing for our remaining contestants has been delayed for 24 hours. We sincerely apologize to those who have been waiting for results today. Please keep an eye on our forums as well as the IRC chatroom for updates. Thanks to everyone for your continued support of ISML, and thank you in advance for your continued patience while we get ready for the regular season. The contestants page has been revamped with a new interface, which should save space and be more convenient to use. Sorting options still to come soon. If you have comments about the page, please register and post on our forums. The international welcome pages have been trimmed of old data, and the contestant lists have been updated for them. A new international message will be ready shortly. Also, a biography has been uploaded for Yami. We are bringing back the forums this year. Please register and start new discussions and campaigns for your favorite characters. Invite your friends into this new community whose primary focus is Saimoe. The link has been added to the main navigation bar, and I switched the placing of Statistics and Contestants while I was at it. We have started our statistics portal, which contains the standings page and other resources. Click on "Statistics" above to access it. Results from the Nominations period are also released. Preliminaries have ended. Congratulations to the candidates who passed to become contestants in ISML. Those who didn't make it this year are surely invited to try again next year. For now, the tournament is on break until early March when we will have the schedule drawings for our new contestants. In the meantime, the staff will be doing preparation work for the regular season. We hope to get more character bios written, and I will try to add some more functionality to the contestants page so everything is easier for you. Updates will come bit by bit on the RSS feed. This will be an exciting year; please look forward to it! Our final preliminary round is just two days away. Congratulations to all the candidates who have made it so far; we are waiting on just one more girl to complete the 64-contestant roster for ISML 2009. Please look forward to a new international message that will explain the voting process during the regular season. We will be scheduling our new contestants soon, too, so you'll be able to see all the matchups through the end of August. And while you're preparing your campaigns for your favorite girls, we'll be preparing new voting forms and getting every ready for the launch of the regular season. More surprises may be on the way, too! Recent website updates include our RSS feed, which I'm steadily learning to use, and a special browsing tab icon for the domain (instead of the default). The spelling of our Group B venue has been properly adjusted to "Busan." We thank our Korean translator wontaek for relaying the request from the Korean voting community and hope that the misspelling has not caused any hard feelings up to this point. All graphics and records of the previous preliminary rounds have been updated to reflect this change. Groupings for Round 7 are now posted, with voting to begin on 9 February. Good luck to our candidates, as only three contestant slots remain! An 8th Preliminary Round has been added to our schedule. We were expecting at least one tie for first place during the first 5 rounds, but this has not happened and probably will not happen in the next two rounds, so we are adjusting the groups for Rounds 7 and 8. The upcoming Round 6 will have four groups as usual, but Round 7 will have only two groups, each with twelve candidates. Two winners will advance in that round, and our final Round 8 will consist of a single group of the remaining twenty-two candidates—thus a free-for-all for the final contestant slot. In the preliminary rounds, candidates who tie for first place in a group will all advance to become contestants. The only exception is in Round 8, and we will have a runoff in that scenario to determine a single winner. Also, should a first-place tie occur in Round 6 or 7, Round 8 will be cancelled, and we will devise a new plan and notify everybody here on the News Page. If you have any questions or comments about this, please join #ISML @ irc.rizon.net and ask for me. I've been informed by mokuhazushi, our hosting system administrator, that our server will undergo some downtime for important maintenance. Expected downtime is tonight, 31 January, and should not last very long. Fortunately, Round 5 isn't until Monday, so the ISML schedule is unaffected by this. Please be patient during our downtime everyone, and we shall be back soon! Also, if you're not aware, we are running low on the number of remaining contestant slots for ISML 2009. Please keep this in mind when you vote or discuss in your communities about voting. We will most likely be done with the preliminary rounds after Round 7. Saving a little space on the voting page by flattening the avatars a bit. You should still be able to tell who the girls are pretty clearly. If you have concerns, please contact us. I've added some rounding to corners on the tables, too, but such CSS is recognized by only Firefox I think. So if you have been visiting ISML using a different browser this entire time, I do recommend you take a peek at it with Firefox (on a friend's computer if you need to) to see what visual styles are enabled. In other news, Minhtam has started a blog covering his thoughts as administrator and saimoe analyst of this competition. He has lots of articles planned and would love your support as readers and commenters. Please bookmark http://minhtam2448.blogspot.com/. In the past two rounds I had updated the main page to note that "Round x is in progress." Because of Internet connectivity errors on campus earlier today, I could not update the page on time. However I hope that everybody knew that voting was still taking place as scheduled. The link to the Voting Arena is always available at the top of the page, and the address is simply http://www.internationalsaimoe.com/voting/. I've tweaked the current notices now to say "scheduled event" instead of "upcoming event" in case I get delayed again in the future; the wording will still be accurate. Apologies for any confusion, but there's still lots of time to get your votes in! In the interest of consistency and ease of recordkeeping, the order of the necklace periods has been reset to the order observed in 2008. ISML 2009 will begin with the Aquamarine Period, followed by the Topaz, Amethyst, Sapphire, Emerald, Ruby, and Diamond Periods. All schedule data has been updated to reflect this change. The start and end dates for all matches have remained the same. Groupings for Round 2 are now posted. Thanks to Juice for organizing them! Also thanks to melange for providing the results graphic for Round 1. He'll be doing the graphics hopefully for the remainder of the tournament, and we appreciate all the effort he puts into them. In the voting arena, you can preview the ballot which will be available for voting tomorrow. Results from completed rounds will be archived in the standings page. Congratulations to our first winners! We will get contestant pages set up for them soon. Groupings for Round 2 should be released sometime tomorrow. Everyone will be reshuffled, and all vote totals will be reset. Voting results will probably be stored away in the standings page. Certain browsers like Firefox and Safari should also be able to highlight the box you click on as well, making your votes easier to see. So far, only Internet Explorer has been found not to support the code I put on it; I'm not sure yet about Opera and other browsers. So before you click that 'VOTE!' button, do double-check the values of the radio buttons in the case of accidental stray clicks. Another improvement is the confirmation page. After receiving positive feedback about confirmation given during the nomination phase, I felt this should be extended to preliminaries and the regular season. Vote confirmation gives you that extra bit of assurance that the server received what you told it, and it gives you a chance to request a vote change in case something did get submitted incorrectly. You also have the opportunity to copy your vote and paste it in your blog or message board. As always, please keep spreading the word about ISML and providing us your feedback. The rest of the staff and I continually strive to make ISML as accurate, efficient, pretty, and fun as possible for you. Thank you, our voters, for your participation! It's just before the first round that I'm writing this news entry, but I want to welcome all of the voters who are out there today. We have 48 candidates ready to prove that they truly belong out here, and they're going to need all the help they can get. That's where you come in. I want to remind you of a few things. First, you can only vote for one candidate per group, and one candidate per group only. Second, if you want to see more than one candidate in one group make it to ISML, don't worry, as groups will be reshuffled for the candidates who haven't won, and the process will repeat until all 27 positions are filled. If you have any questions, contact me at [email protected]. Good luck. Well, we're earlier than expected. The top 48 entries have been nominated and placed into their Round 1 groups. I would like to remind everyone that Round 1 will begin on Monday, January 19 at 0000 GMT. Remember, the winner of each group will become an ISML 2009 candidate and will compete in the regular season. The rest will be seeded into different groups, and the process will repeat. If you have any questions, contact me. You should probably know where to find me by now. Good luck. By the time you read this news entry, the nomination period would be over. Please note that we will NOT release any information or results regarding the nomination period until we have gone through the procedures of vote-checking, vote-tallying, and background-checking. Furthermore, when we reveal the candidates who will take part in the preliminary phase, we will NOT reveal how many points each candidate gathered during the nomination phase. If we do ever reveal the nomination points, it would only be until after the preliminary rounds are concluded and all 27 positions are filled, and we will only reveal the top 100 nomination spots at most, as we do not have the time to discuss background check for all of the nominated candidates. Finally, we will work hard to finalize the list of the 48 preliminary candidates as fast as possible. In addition to the staff constantly arguing about which candidates pass background check and which do not, I will be moving back into college this weekend, so the process will take at most a week. But we will try to get the list finalized before I start classes this Monday so that you may prepare for what is ahead. If there's any questions, feel free to contact me or join the IRC channel. The rules have now been translated into Vietnamese (Tiếng Việt). Many thanks to KholdStare88 for this effort! The German welcome page and rules are now complete. We appreciate Huy and Eisdrache's hard work! ISML is still in search of a Japanese translator if you or someone you know has the knowledge and the spare time to help us out. We have also received over 300 nominations so far for the remaining 27 slots in the 2009 league. Let your friends know and keep them coming! There is now an update to the rules. Most of the staff think that 32 is too low of a number to place into preliminaries, so we have increased that number to 48. After the preliminaries, 27 characters (from the 48) will be admitted into the regular season; this part of the rules hasn't changed. If you have more questions, you can refer to section III.ii.A of the rules. The Spanish (Español) welcome message has now been completed. Thanks to DarkEdgar (The_Returner123) for his work! I'm a little late as usual. As a Roman Catholic, I've had quite an eventful Christmas, and I'm about to have quite an eventful New Year's as well. At the very least, I have some time to write something before the Nomination Period begins. Speaking of which, we are getting close. Three days more and we can officially kick off the 2009 preseason. As a result, we are trying to finalize a few things before we go off and start the nomination period, so you may see other parts of this site changing little by little, but we want to start 2009 on a high note, and since the regular season is actually in ten weeks, we have a lot of time to get the things we need to get done. You may nominate from ANY airdate. So yes, you can nominate someone from the 1980s, 1990s, or 2000s, and beyond. Do not nominate any male candidates. This contest is female only. Do not nominate any candidates from this list. These candidates are already qualified to take part in this year's competition. We strongly prefer that you use the English Romanization of the names of your candidates, but if you do not know the English romanization, you may choose to nominate in your own language. In addition, you should not try to go out and, well, cheat. That is, do not multi-nominate as you would not multi-vote. We have increased our staff for the nomination phase, so any and all forms of cheating will be removed without hesitation. Therefore, please follow the rules and nominate properly, so we can have a smooth and successful tournament. The nomination phase will begin on January 1, 2009 @ 0500 GMT, right at the same time when the ball drops on Times Square in New York City. For those of you who live in the Eastern United States, tune in to ABC to watch the festivities, and then send in your nominations right afterwards. The nomination phase will conclude on January 8, 2009 @ 0500 GMT. Following the conclusion, we will NOT post results immediately one hour later, as it may take hours, perhaps days to check the nominations, tally them, and then conduct a background check on all of the candidates. Also, we will release only the candidates who have not made it to the preliminary round as well as their respective point values. We will NOT release the final order of the candidates who have made it, nor will we reveal point values, until the conclusion of the preliminary phases. We will, however, list the candidates who will move on to the preliminary round hopefully on January 15 at the latest, so please stay tuned. We hope to kick the 2009 season off as smoothly as possible. Good luck to all the newcomers and hope the best results come out of this. seemmeriast has more of the Thai welcome message translated. A kind member of the AniZone forums has also provided nominations instructions in Korean (한국어) for us. Thanks! The official rules have now been translated into Thai (ไทย). Parts of the Thai welcome message are also available. Thank you, seemmeriast! Welcome messages are now available in Chinese (繁體中文, 简体中文) thanks to the efforts of Basaka (infinite_zero)! All of our contestant pages are being updated and improved this week. The Staff has elected to use the Hepburn romanization universally throughout the website. We will also favor the romanizations used by the original Japanese publishers and artists (such as Holo instead of Horo). If you have any comments, corrections, or questions, please use the contact page or join us on IRC. The Staff wishes to be as accurate as possible when representing the characters. Things have slowed down as of late. It's finals week for the majority of us, and we've been cutting back to make a final run for our grades, so don't expect much until sometime around Christmas break. The International Message has been completed and sent out to be translated in different languages. This somewhat short essay also has the official starting times for the nomination period and each of the preliminary rounds. Nominations will begin at January 1st @ 0500 GMT, while Preliminary rounds will start at 0000 GMT. Because of the new automated voting page rotation system, times will not be postponed except by means of a server error. The official rules have now been translated into Spanish (Español). Much thanks to DarkEdgar (The_Returner123)! The official rules have now been translated into Chinese (繁體中文 and 简体中文). Much thanks to Basaka (infinite_zero)! The Master Schedule has been updated to include all the candidates currently on our roster, as by the results of our schedule drawing from earlier today. You can now download a preview of our master schedule, detailing all 2016 matches, their dates and venues, organized several ways. As contestants are scheduled, this spreadsheet will be updated. Future work will be done to allow easy data input in the spreadsheet so you can follow along with the tournament. I did say that the Periods will be assigned necklaces, but I didn't say that they will be going in order of A, B, C, D, E, F, G. The order had been determined after the Tier 1 drawing for quite some time now, and I haven't had the time to announce it. The order has been announced on the front page, and all of the schedule images will be reordered to show the order announced on the front page. Also, I did say during the drawings that there will be 32 locations chosen to be "venues". While it's awesome that we're going to be "holding" matches at these venues, understand that it's nothing more than an excuse to not use an "Arena #" to label the match venues. So while it's cool to have 31 countries playing host to these matches, I won't announce where they really are as of this point. If you would like to know, you may either e-mail me or wait for the master schedule file that Crisu will be working on. Finally, I will remind you that there will be a schedule drawing this Wednesday for the rest of our candidates. I hope to see you on IRC live! chaosprophet (now listed on the staff page, which I keep tweaking) has provided a Portuguese translation to our rules. Thanks very much for your hard work! Rotating title banners are being put in place. Criticisms are welcome. The contestants page is also being worked on this weekend. The first schedule drawing has been completed. Follow along with the seeding spreadsheet if you like; we'll update the online file periodically. I have moved the chat client to within the contact page and set the default channel to #ISML. So if you don't have your own IRC client, you can use the Mibbit one embedded on our site. The chatroom has no content restrictions, so please use discretion when participating in chat. Our translator team is getting to work on the rules, and we're very appreciative of their time and effort. Right now we have a small section of the rules translated in German. More languages to come. As Minhtam informed earlier, I am here to explain the Tier System and the procedure for the drawings. As this table shows, all the Initial Roster contestants have been seeded. The Pre-Ranking system weighed the performance of Contestants outside of ISML with the Win performance of Contestants within the ISML Round Robin Tournament. Contestants not competing previously in the Round Robin Tournament were given an arbitrary value and added to create an index value. These index values were then sorted in ascending order and given an ordinal rank called Pre-Rank. This value was then added to the ISML Final Rank (using only Points with a tiebreak of Wins for Contestants ranked 17th and weaker) to create a Seed Value for each Contestant. These values were then sorted in ascending order. The lower the value, the higher the seed. Any ties in Seed Value were broken with preference to the Contestant with the stronger Pre-Rank. These contestants were then split into groups as determined by the schedule: 1 group of 7+1 and 4 groups of 14. Groups were filled in order by seed with Tier 1 have the strongest seeded Contestants, Tier 2 have the next strongest seeded contestants, etc. Before Pre-Ranking and Seeding began, it was determined that the Wild Card slot would be given to the eighth (8th) strongest seeded Contestant. The seven (7) Contestants in Tier 1, as well as the 14 Contestants in the remaining tiers will randomly placed by a Bot using a Random number generator. The highest seeded Contestant in a tier is placed first followed by the next highest seeded Contestant in the same Tier, etc. until all slots are filled. I hope to see you later today @ 2600 GMT. If you have any questions relating to Scheduling or Seeding, please vist us on #ISML @ irc.rizon.net and ask for Juice. Until then, Take Care. If you look at the schedule closely, you can see that there's a public schedule drawing that is scheduled for today. Look closer and you will see that there's a tier system that we are using. Confused? Well, Juice will stop by and give an explanation of the tier system later. Since the first schedule drawing is slated for today, I think it's time that we keep you waiting no longer. Click here for the tiers each candidate has been placed in, and you know which candidate will be scheduled today and which in two weeks. Also note that while Tamaki Kawazoe has been placed in Tier 4, she will be given her schedule at the same time as the Tier 2 and Tier 3 candidates. After Haruhi is placed on the schedule, we will assign which period will get which necklace, so the inital dates for these eight candidates will be immediately set. Tomorrow, or technically today at around 2600 GMT, the drawing will take place live on IRC at #ISML2009 @ irc.rizon.net. A widget will be placed on the main page for the sole purposes of this drawing, so you would not have to log on to an IRC client in order to view the drawing. This way, you will know where all eight of these will be placed on the schedule. Rules, Revision E uploaded. Rule II.ii.C: "automatic entries" changed to "automatic qualifications." Not necessarily a revision but a correction of a wording oversight. Many thanks to Marina for providing a banner for the 2009 tournament. We may possibly have more banners that we'll rotate throughout the year. Please stay tuned. Also, since we now have a banner to separate the current website from the old one, the 2008 website is now fully archived and viewable at any time for reference. The Initial Roster for 2009 has been announced. I apologize for being late on this one, as it's that time where college courses are also closing out, and rather early for me, as I was caught really off guard by the time span. 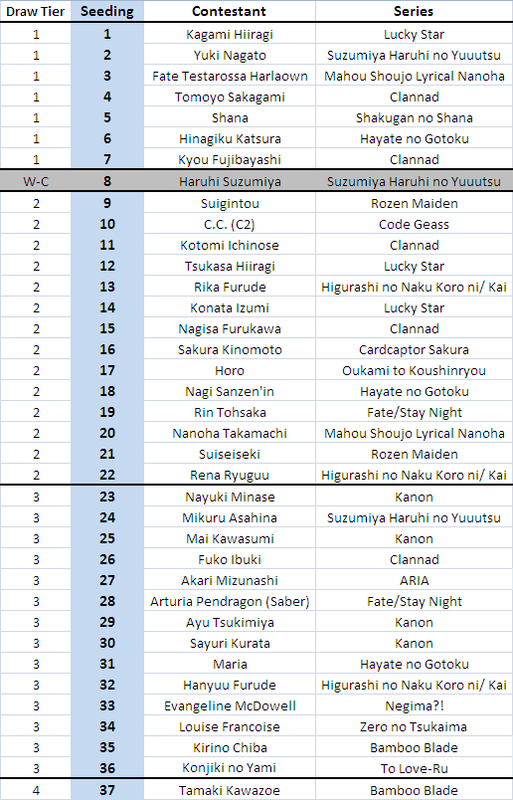 There are currently 37 candidates on the initial roster, which includes all .500 ISML candidates from last year as well as three newcomers and one candidate looking for redemption, the latter four entered by way of Japan's and Korea's Saimoe tournaments. The initial list is not final, as the Korea Super Best Moe Tournament is still on going, and most likely the top 8 from that tournament (sorry boys, but girls only) will enter that list. We will still have extra nomination slots regardless, so our new preliminary system should prove to be an exciting one. If you have any questions, Please visit us on #ISML @ irc.rizon.net. If you prefer to talk to me personally, contact me at [email protected]. The 2009 Contestant Schedules are now up. The top row contains the Contestant Slots (Contestant Names will replace slots after all drawings) while the rows contain the Opponents the Contestant would face on a given Period and match day. I wish to emphasize that while this is the Final Schedule, the ORDER of the periods is tentative. The order will not affect the strength of any Period schedule, and the Period Order will be finalized at least 12 hours after the Tier I drawings, tentatively scheduled for later this week. If you have any questions or comments, please email us or visit us in IRC (#ISML @ irc.rizon.net) and ask for Juice. The 2009 Rules page is online. I do apologize for the tardiness of its being posted and assume full responsibility. However everything ought to be accurate and clear now; we've had to go through some last-minute (and after-minute) rewrites. The rules are currently in Revision D; major changes since Revision C were to the rules about the nomination form. The form will be exactly like last year's, but C's rules were too ambiguous on what you can do with it. D has fixed it. If you see any other discrepancies or ambiguities, please don't hesitate to email us or visit us in IRC (#isml on Rizon). The ISML 2009 Schedule has been announced. The preseason schedule that you see is very tentative and subject to change. The dates for the nomination rounds and preliminary rounds, however, should be correct and final, though I suggest not to take anything for granted. The nomination system, obviously, will be much different than last year, and those who were around last year knew how defunct we started out. Details on this will be provided about Christmas time, so you should keep yourself updated. Next Friday, our team should have the majority of the official rules finalized. The official rules for the International Saimoe League 2009 will be posted in English before it gets shipped out to our translators, so if you know the rules jargon, you can understand exactly how we will run this contest next year. Speaking of which, we're looking for translators for any language, even the ones we already have, not to mention other kinds of staff of all sorts. So if you want to help us out, e-mail me at [email protected], and I will certainly find a place for you. Also new for next year is the schedule drawing. This idea has been proposed by Juice, one of our newest staff members, and its purpose is to have a random drawing for the respective round-robin slots while still maintaing a somewhat balanced strength of schedule to try to make it fair for all candidates. There will be no more Kagami running away with an easy Amethyst schedule, as our new system should do well from the marketing standpoint, and it should make the necklaces matches more exciting next year. We don't have the full details for this yet, but it's certainly a project we will be working on for the next few weeks. We've also made a slight change to the postseason, but it's way too early to start thinking about that now. I'll inform you when the time comes. Of course, if you really want to know, head to our IRC channel -- #ISML @ irc.rizon.net. Some everyday voters are already well informed of what's going on, so they should help you out as well. Thanks for making ISML 2008 a success. We hope ISML 2009 will be even more explosive. The ISML 2009 schedule announcement has been postponed to Saturday, 8 November. Special thanks to raizoo and KholdStare for their work on the award poster for Fate. Final rankings and standings are posted. Congratulations to Fate Testarossa for winning ISML 2008. Because Yuki is eliminated, we will not be having the second Final Round on Friday. Instead, Friday will be reserved for announcing the schedule for ISML 2009--I repeat, just the time schedule, listing important dates of nominations and matches. The actual contestants have yet to be determined. On behalf of the staff, I'd like to thank everyone for being patient and cooperative with us this first year of the International Saimoe League. We've learned a lot so far, and we have big plans for next year. So please stick with us and prepare to have a lot more excitement and fun come 2009.